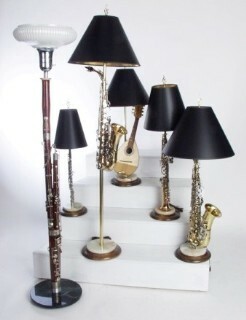 Symphonic Lighting specializes in handcrafted, functional and artistically-designed musical instrument lamps. The result is impressive, attention-grabbing, conversation pieces that never go out of style. Whether it’s the class of brass, the understated beauty of wood, or the wild look of an electric guitar, Symphonic Lighting handcrafts one-of-a-kind unique lighting fixtures in harmony with your needs. Symphonic Lighting, a family owned business since 1993, has taken great pride in each lamp that we have made. Starting our business at a small art fair with only 10 lamps to sell, we now produce and ship our lamps nationwide. We specialize in customer service and can provide the musical instrument you select. You can also provide your retired musical instrument or one left behind by a loved one. We will then work with you one on one to create your matchless lighting fixture. Our mission is simple: To recycle retired, un-repairable and non playable instruments into unique artistically designed lamps that bring pleasure and a smile to our valued customers.